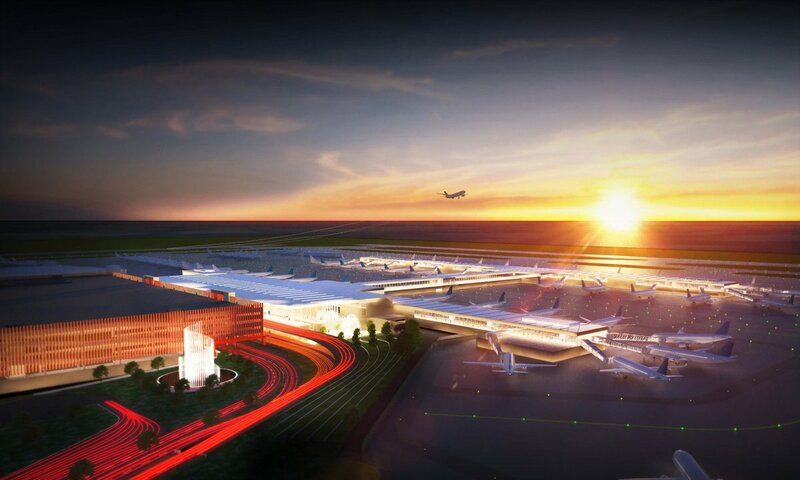 Progress on the $1.3-billion Kansas City International Airport (KCI) is moving along after delays and a brief developer kerfuffle in December that saw AECOM attempt to win the project back from the Maryland-based Edgemoor Infrastructure & Real Estate/SOM team. After soliciting community feedback, the SOM-led design team has released another round of renderings and revealed a more subdued version of the curvy terminal buildings seen previously. 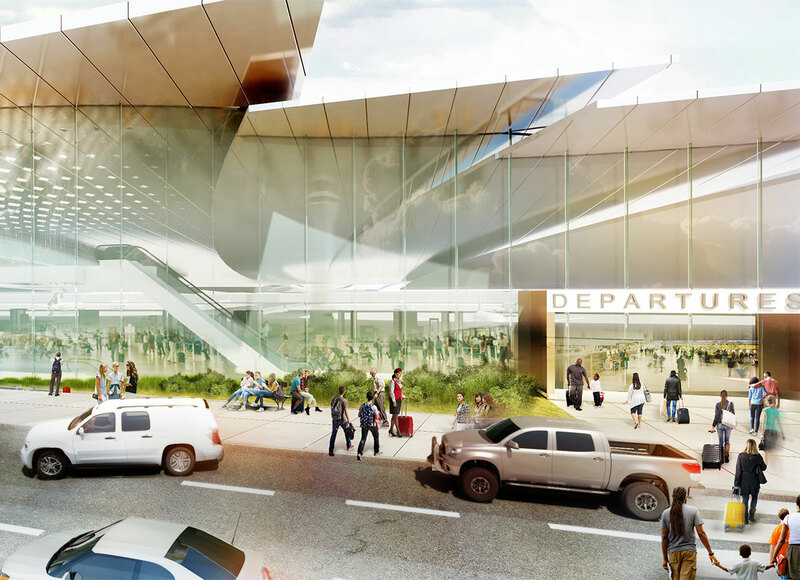 Voters initially approved the $1 billion replacement of the aging KCI last November. The clover-shaped airport originally opened in 1972, and its three drive-up, horseshoe-shaped terminals were rendered difficult to navigate following the release of new airport security requirements the same year. 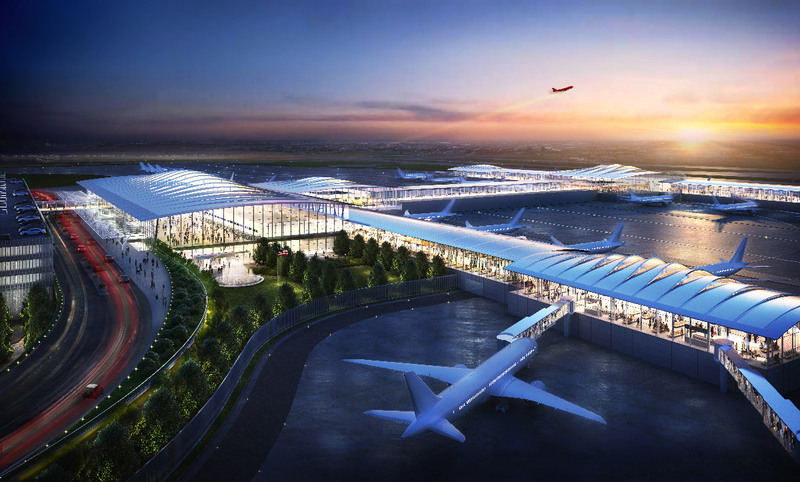 SOM’s H-shaped airport will consolidate all three terminals into a single building while keeping the curbside access that Missourians are used to. The original renderings, revealed after Edgemoor and SOM had secured the project, depicted a light, glassy building with a rippling roof and sail-like fins. In the updated designs, the roof has been smoothed out and flattened, a two-story fountain originally located in the departure and arrivals area has been removed, and a 4,500-square-foot lounge for frequent fliers has been added. Instead of the indoor fountain in the check-in area, which SOM removed to speed up arrivals, an outdoor water feature has been proposed for the area in front of the parking garage. A centralized “cul-de-sac” with retail and dining options along with a round performance space has also been replaced with a more rectangular "town square," which will feature local businesses and a teardrop-shaped performing area. The number of bathrooms will more than double, from the current 63 to 130, and SOM has used community feedback to design wide, accessible bathrooms for those traveling with baggage. Seven more community meetings have been scheduled for this September as Edgemoor continues to solicit stakeholder feedback. Demolition of KCI’s Terminal A is currently on hold while the Federal Aviation Administration conducts its environmental assessment, which should be complete sometime in September or October. The airport has already pushed its opening back from November 2021 to fall 2022 as the number of gates has risen from 35 to 39­­—the KCI currently has 31 gates in operation. While no budget has officially been set yet, the cost estimate has risen from $1 billion to $1.3–$1.4 billion, with the airlines pledging to pay for any additional costs. 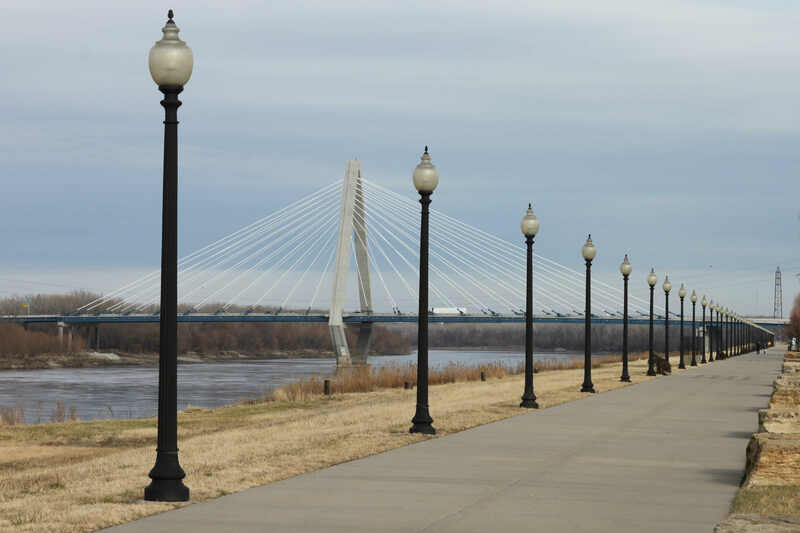 Located squarely in the middle of the U.S., Kansas City is about as far from an international border as a place can get, yet the architectural output of this little city punches above its weight. Kansas City has sprouted a number of notable architecture firms that work on local, national, and international stages. 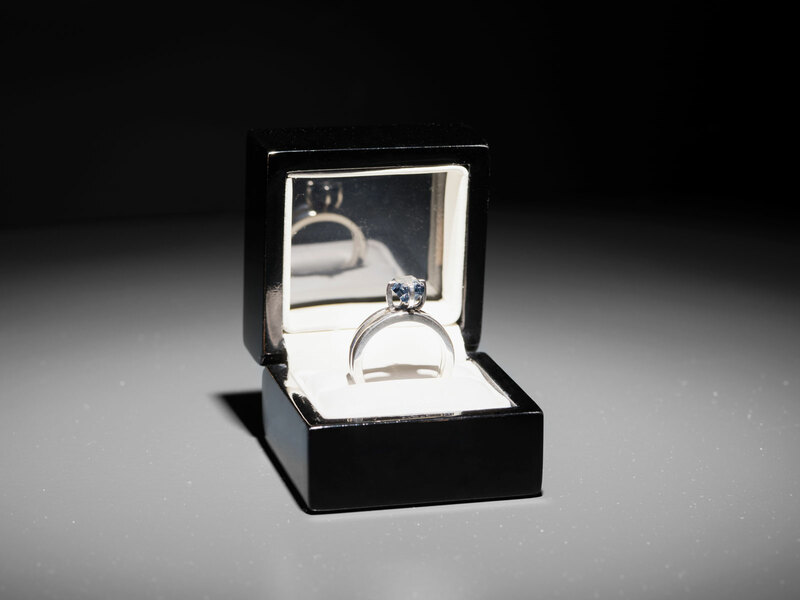 Consider glass and metal specialists, Zahner, for example. 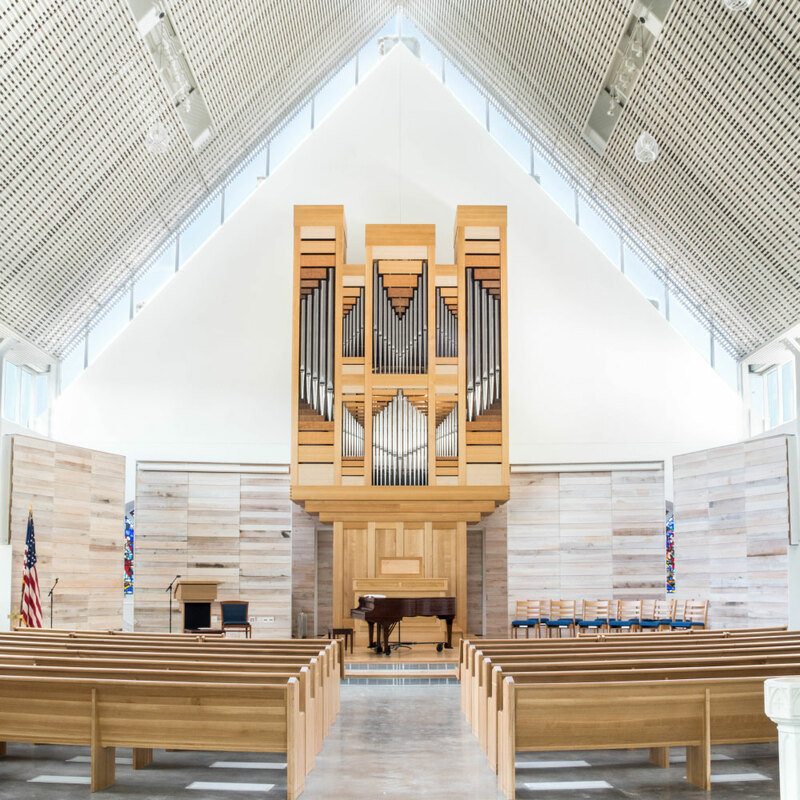 The firm, which has been based in Kansas City for more than a century, has produced intricate facades and custom fabrications in Asia, the Middle East, Europe, and North America. 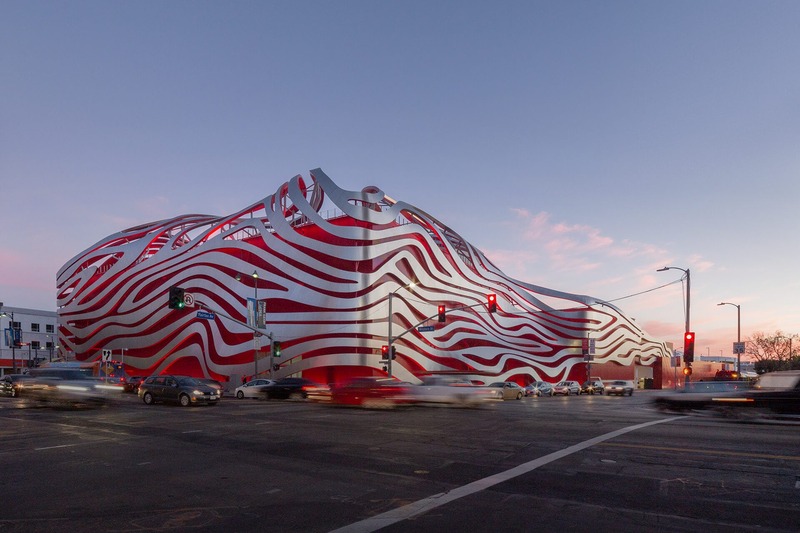 These include the Kauffman Center for the Performing Arts and its own headquarters in Kansas City, the Petersen Automotive Museum in Los Angeles, Grace Farms in Connecticut, the Miu Miu Aoyama luxury retail store in Tokyo, a Maggie's Center in Dundee, Scotland, and a soccer stadium in Basra, Iraq. Zahner has now become the industry's go-to for bespoke, complex facades. The latter was a collaboration with another Kansas City-based firm, stadium specialists 360 Architecture (now HOK). Known as the Basra Sports City Stadium and completed in 2013, the development's landmark 65,000-seat stadium is draped in perforated and pre-weathered Solanum Steel panels that fall between an undulating concrete surface. "People wouldn't usually recognize a Kansas City firm for such a project," said Travis Bailey, a Senior Project Architect at HOK. "There's a lot going on here, locally and internationally, various project types and scales, and numerous types of innovation." Design excellence is being practiced in Kansas City, too, as local firms Helix Architecture + Design, SFS Architecture, Walter P Moore, Populous, STRATA Architecture + Preservation, BNIM, and Gould Evans are demonstrating with a mix of new and adaptive reuse projects, all varying in typology. 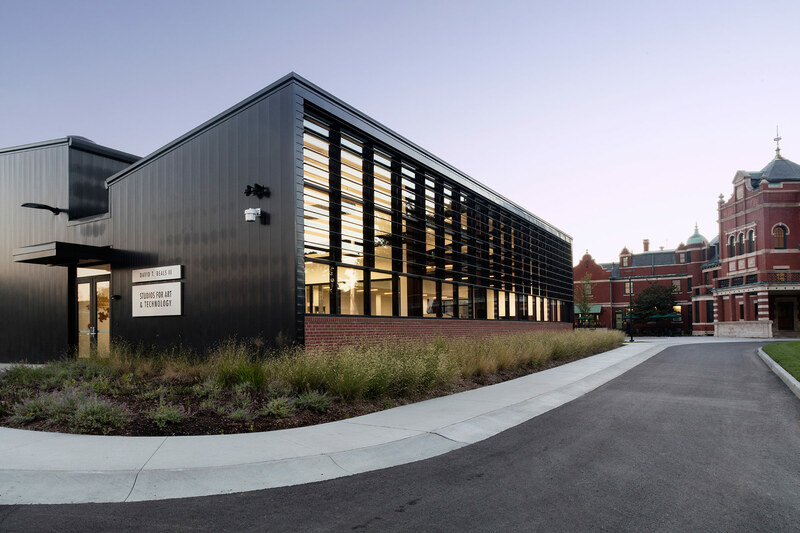 Helix Architecture + Design's James C. Olson Performing Arts Center for the University of Missouri is a renovation and 4,000-square-foot expansion, completed in 2016, to address the functional deficiencies of the inherited 1970’s building. The renovation brought in more light and updated internal spaces. A new, bigger lobby has been encased by an added exterior glass curtainwall facade to enhance the building’s presence on campus, while improvements to the Spencer Theater have been made and a patron lounge expanded. Representatives of all these firms will be on hand to delve deeper into the growing architectural resources Kansas City has to offer at Facades+ AM next week on July 19. There, Travis Bailey will be joined by Gus Drosos, Technical Principal at HOK, as conference co-chair, overseeing three panels. 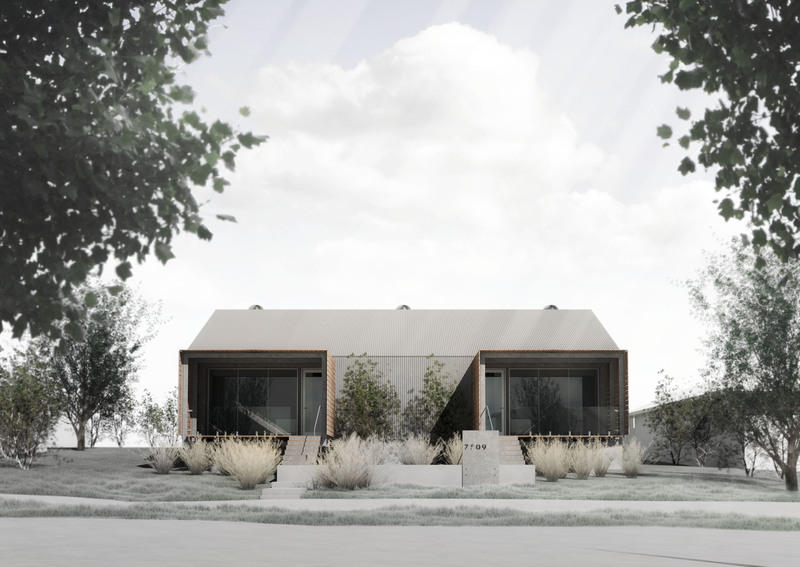 These will look at how firms offer facade solutions in Kansas City, the U.S., and beyond, addressing the climate, client, and cultural challenges these bring. For more information click here. Seating is limited. 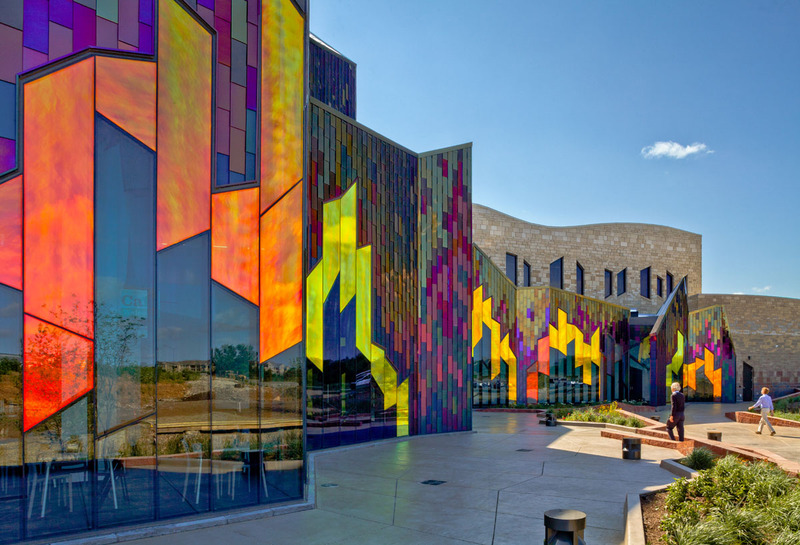 Gould Evans’s recently completed addition to the Kansas City Art Institute will be the star of a forthcoming PBS show. The semiannual Make 48 competition was recently held, and filmed, in the new David T. Beals, III Studio, where 15 teams had 48 hours to plan, prototype, and present their ideas for prices and potential licensing. The event will be edited into eight half-hour episodes, which will be aired sometime this summer. The David T. Beals, III studio adds 5,000 square feet to the KCAI’s Volker Building, which houses the school’s sculpture department. The simple structure, clad in black matte metal paneling, is intended to stand as a counterpoint to the school’s original home, the 1896 Vanderslice mansion. The new building is filled with bright open studio spaces and the latest in fabricating technologies: laser cutters, engravers, eight types of 3-D printers, CNC routers, cameras, scanners, touchscreen interfaces, and a digital loom allow students to create and collaborate on projects of varying sizes and complexity. The project also adds a new gallery and critique room to the school. Students at the KCAI study everything from ceramics and sculpture to animation and graphic design. The school, a private independent four-year college of art and design, provides Bachelor of Fine Arts degrees in 13 majors, and a post-baccalaureate program in art education, certificate programs, and continuing education courses. 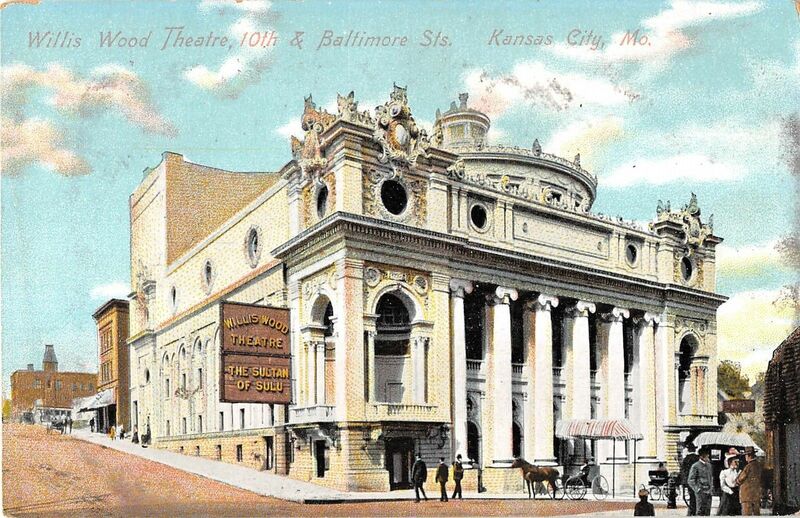 The new building represents the intention of the school, as the oldest arts organization in Kansas City, to prepare its students for the future. Heitmann & Associates President and CEO Glenn Heitmann is surprised that more developers do not take advantage of one solution to the demand for new residential or commercial space: retrofitting an existing building. Like other cities in the United States, said Heitmann, Kansas City, Missouri is home to a surfeit of buildings constructed during the 1950s and 1960s “that have gone through a useful life cycle as it relates to the facade.” But while these structures might not meet contemporary demands for efficiency and comfort, “Rather than tear them down and start over, we can say there are choices,” said Heitmann. Heitmann, who will participate in a presentation block on “(Re)designing Downtown” at the upcoming Facades+AM Kansas City symposium, sees existing buildings as “clean canvases” onto which builders can project just about anything, from surface rehabilitation to a complete aesthetic update. That said, a few facade-related factors outside the design and construction teams’ control can help determine the scope of the retrofit. The first is that renovated buildings must meet current building codes. “A building built in the 1950s was constructed for that code,” said Heitmann. “But keep in mind that your new building skin has to comply [with contemporary codes]. That means anything we do now needs to be airtight and thermally efficient.” Second, explained Heitmann, would-be retrofitters must consider the condition of the anchors holding up the existing cladding. If they are in good shape, the team can opt to keep them in place. But if “over the years air or water infiltration has compromised structural integrity,” said Heitmann, they may need to start from scratch. Asbestos can also present a challenge. “Most people think about asbestos on the interior,” said Heitmann. “What I’m talking about is sealant or byproducts that make up the exterior facade.” In bringing up asbestos, he said, his intention is not to “use scare tactics,” but instead to encourage architects and builders to think through every facade renovation “clearly and holistically.” Whether of an occupied or a vacant building, said Heitmann, retrofitting can be a powerful tool by which to improve a property’s financial value—not to mention occupant comfort. One example he cited was an office building in prime location that, through renovation, catapulted from Class B to Class A. Another concerned a “very high end” residential structure constructed in the 1960s. “People were frustrated,” said Heitmann. “They loved it, they loved the views, but they saw their investment dwindling” due to inefficiencies. A revamped skin, including new glazing and framing, brought the property up to snuff. Learn more from Heitmann and other facades experts from Kansas City and beyond at Facades+AM Kansas City. Register today to secure one of the few seats remaining.